Big things happen in Lynn Shelton’s films, but they happen in the quietest of ways — and “Outside In,” which premiered on Friday at the Toronto International Film Festival, is no exception. While it’s more dramatic and less comic than most of Shelton’s previous work, it’s another fine example of the writer-director cloaking moments of import in understatement and naturalism. The film stars Jay Duplass, who co-wrote the screenplay with Shelton, as Chris, a convicted murderer who’s released from prison after 20 years, largely with the help of his former high school teacher, Carol, played by Edie Falco. Their twice-weekly phone conversations have created a deep bond that turns romantic in Chris despite the age difference. Carol, stuck in a stalled marriage, is flattered by the attention but skeptical of the idea that anything could actually happen. And to complicate matters further, Carol’s teenage daughter Hilde, played by Kaitlyn Dever, also becomes enamored of Chris, in an age-inappropriate relationship in the other direction. Messy entanglements have been a staple in Shelton’s movies for years, including “Humpday,” “Laggies” and “My Sister’s Sister,” though more often than not she plays them for gently uncomfortable laughs. But “Outside In” is a real drama with only the lightest tinge of comedy; the plight of three people, adrift in different ways and looking for connections that may well be unwise, carries with it a uneasy sense of dread that one or all of them are headed for a fall. In a post-screening Q&A at the Ryerson Theatre, Duplass talked about interviewing ex-cons who’d recently ended long prison terms, and finding, he said, that with them “every interaction was so intense and raw and fraught with danger and potential.” He gives his scenes that sense of a man who’s so on edge that a welcome home party is nearly unbearable and a personal interaction with anyone other than his old teacher is painful. The film circles the characters as they circle each other, connecting and pulling back and making foolish decisions one and all. But where some of the situations could be played for melodrama, that’s not Shelton’s game — percent, for that matter, Duplass’ either. Instead, this is life and these are people. They do some dumb stuff, some smart stuff, some inexplicable stuff. Big and little things happen, uneasy accommodations are made, and whatever quiet peace these people negotiate seems fully earned, by the characters and by the filmmakers. Though it's not as robust as the annual Sundance Film Festival market or populous as Cannes' Marche du Film, TIFF is a pedigreed springboard for solid indies. Here are this year's hottest films for sale. Arguably the hottest title for sale at TIFF 2017, producer-star dynamo Margot Robbie offers up a drama about U.S. Olympic figure skater Tonya Harding and her notorious involvement in the beating of teammate Nancy Kerrigan before the 1994 Olympics. Buyers are dying to see this one. Richard Eyre’s drama has an attractive cast in the firebrand Emma Thompson (who wouldn’t buy this movie simply for the joy of watching her promote it?) and Stanley Tucci, reunited after the recent box office smash “Beauty and the Beast.” The film is an adaptation of Ian McEwan’s same-named novel, about a British judge asked to intervene when a minor refuses a blood transfusion over his religious beliefs. High-brow horror is hard to do, but a category critics and select audiences adore for delivering chills without the tackier conventions of the genre. “The Cured” would certainly check that box, thanks to a clever and unsettling premise: A portion of the population became zombies but were cured. They suffer extreme judgment in a recovering society for, well, eating other people. Christian Bale reunites with his "Out of the Furnace" director Scott Cooper for this gritty Western -- already putting Bale in the Oscar conversation after an earlier festival debut. Rosamund Pike, Ben Foster and Jesse Plemmons co-star. Perhaps the dreamiest trio at TIFF, auteur Wim Wenders will offer up a romance between Alicia Vikander and James McAvoy. The former plays a deep-sea researcher, the latter a water engineer, attempting to connect across continents and oceans while a civil war rages. Giving a fabulous middle finger to helicopter parents, Nicolas Cage and Selma Blair star in writer-director Brian Taylor's super-dark comedy about a 24-hour hysteria that sees parents attempt violence against their own children. 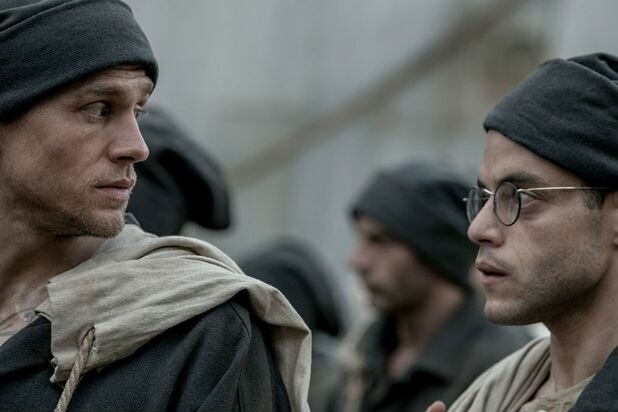 Charlie Hunnam and Rami Malek star in a remake of the 1973 thriller that starred Steve McQueen and Dustin Hoffman -- where two men plot an escape from a prison island. Jon Avnet sets about the ambitious task of creating both a black comedy and a film that gets mental illness right. Richard Gere stars as a doctor treating three paranoid schizophrenics (Peter Dinklage, Walton Goggins, Bradley Whitford) who all believe they are Jesus Christ. This politically charged gay love story pits Kate Mara and Ellen Page against each other on two sides of a capital punishment debate. It also brings them together romantically. Trivia: The official TIFF festival guide labels Page a "powerhouse Canadian," which just makes us smile. Natalie Portman produces this well-received doc about the horrors of meat consumption based on a memoir by Jonathan Safran Foer. Screenwriter Sergio G. Sánchez makes his directorial debut in a buzzy, supernatural thriller about four children orphaned by the loss of their mother. The lost brood take refuge in an abandoned house only to find sinister forces lurking there. Jessica Chastain and Michael Greyeyes lead this substantive drama about New York artist Catherine Weldon, who became the trusted confidante of legendary Sioux chief Sitting Bull.